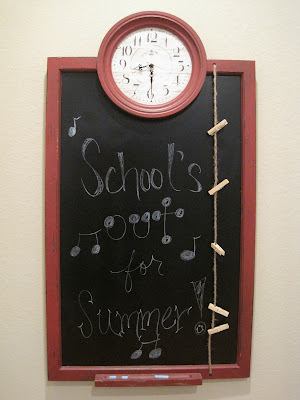 Today is the kids' first official day of summer break! They got out of school early yesterday, and we spent the afternoon with Amy & Alex. Then after dinner, we celebrated by going to BerriBlends for frozen yogurt! We were not only celebrating the end of school, but super TAKS scores! Between the two kids, they got commended on 4 out of the 5 tests (& the one score that wasn't commended was very high in the "met standard" range)! Overall, it was a great school year for both of them. They made friends at their new school, were loved by their teachers (who wouldn't love them?!) & made great grades. I even made some new friends, too! I'm hoping this summer will be fit, fun & frugal like last summer! For starters, Cody & I picked up Summer Movie Clubhouse tickets again. I think we'll have some Wii Fit contests amongst the family. We plan to take advantage of our neighborhood's super great pool, too! But I need help with other frugal ideas! I hope y'all have a wonderful summer! & seriously, if you have any summer ideas, please fill me in!! Yip Yip!!! Yay for the kids and their outstanding scores!!! We are enjoying the last day of school too!! My frugal idea would be renting movies from the library instead of blockbuster. Not the best selection, but very economical!